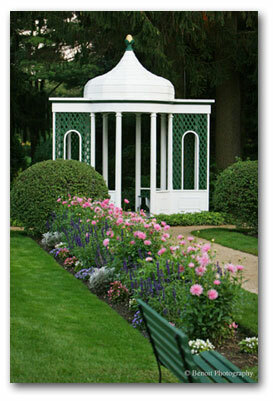 The tradition of a folly or gazebo as a garden retreat, goes back at least to the gardens of ancient Rome. Here in New England, with our short summers, the idea of a shady retreat, a place to enjoy a cool refreshment on a warm afternoon holds great appeal.. A summerhouse or gazebo is a pleasant spot from which to contemplate the garden or view, and simultaneously, can be beautiful feature or eye catcher in the landscape. A rare few survive from the 18th century here in New England. They are usually enclosed, and though made of wood, and on a smaller scale, recall their cousins on grand estates in England. It was not unusual for these structures to be placed on a small artificial ‘mount’ in the English after European fashion. Unlike England, with its large preserved country estates, America has always been a country on the move, and most of the earliest that survive do so because they have been moved from their original settings. 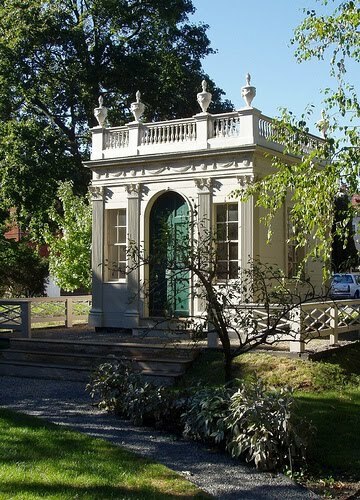 An early survivor is the 1766 summerhouse from the garden of Abraham Redwood in Newport RI, erected long before that seaport city became the most luxurious resort of the gilded age. 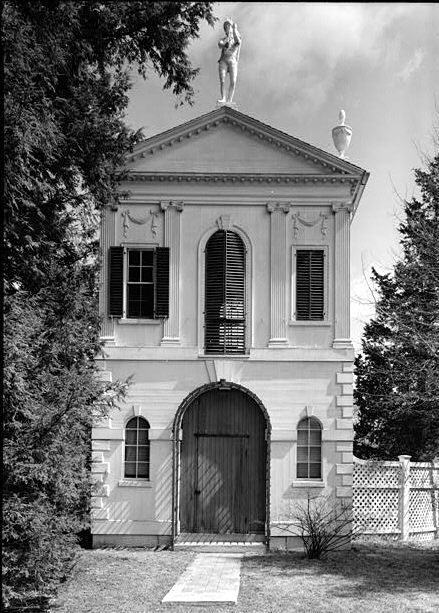 In the 19th century, it was moved to the grounds of the exquisite Palladian library that he endowed in the mid-18th century, the first library in America. The chaste octagonal facade is of wood, rusticated and surfaced with sand in the paint to emulate stone. 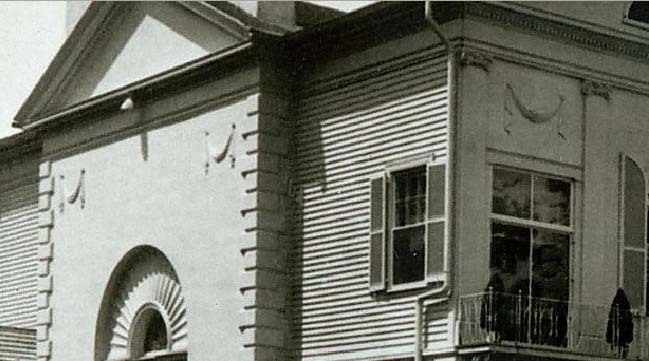 At the Isaac Royall house in Medford, Massachusetts, was this grand affair topped by a statue of Mercury, built in the mid-18th century, on an artificial mount that hid an ice house below it in Capt. Royall’s pleasure grounds. By the early 20th century, his grounds were swallowed up by development, and all that survives of the structure is single arched window frame. The Endicott family enjoy their re-located summerhouse. In the late 19th century, the summerhouse was near ruin, and development pressures were closing in on the Derby farm. 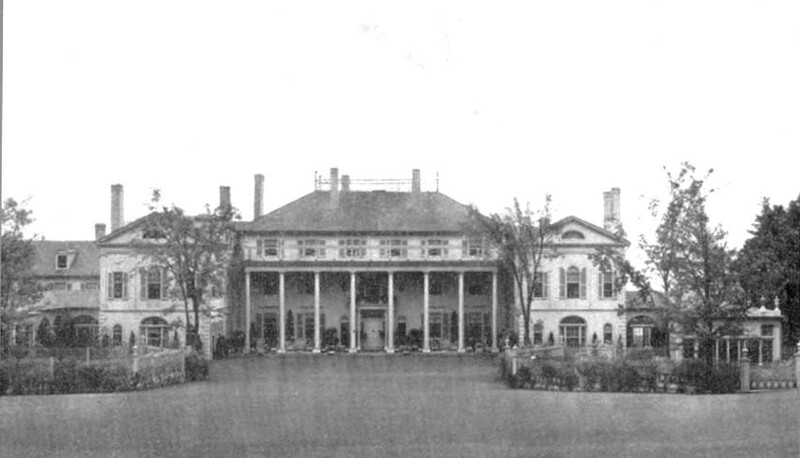 Derby’s great-granddaughter, Mrs. William Crowninshield Endicott, rescued the it, seen on its original foundation in the upper photo, and had it moved to her nearby country estate, where it still graces the rose garden designed for it, now open to the public. Okay, now bear with me for a second, for you know how I like all the dots connected, and this part requires your full attention. 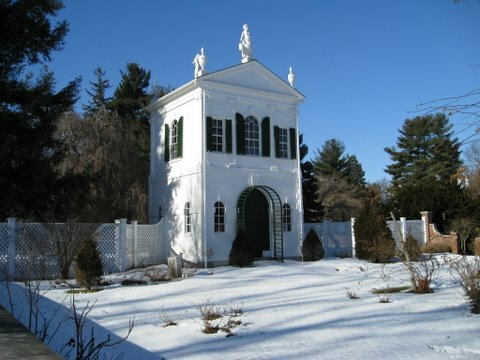 Already in the garden of the Endicott estate was a gazebo built in 1840 by Mrs. Endicott’s grandfather, Joseph Peabody, from whom she inherited the estate. 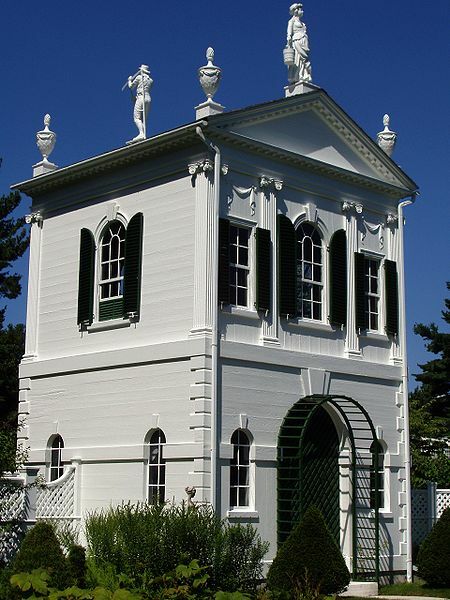 Upon the death of her daughter-in-law, Mrs. Endicott, Jr., a nephew inherited the Peabody gazebo and moved it to his property on Martha’s Vineyard, where it sits to this day. 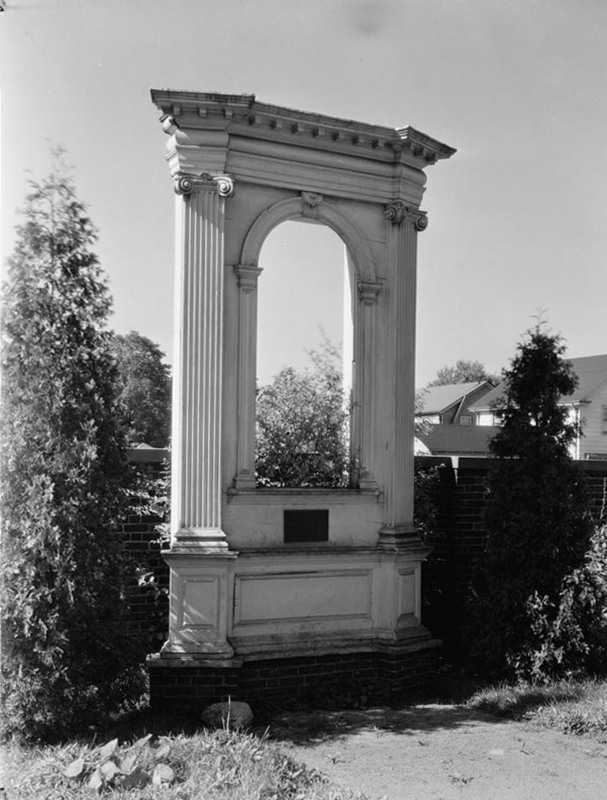 In 1989, the Danvers Historical Society erected a replica of this structure, above, in the original location. Email me if you need a re-cap. As I’ve mentioned before, we really like moving buildings around here in New England, and sometimes a playbook is required to keep it all straight. 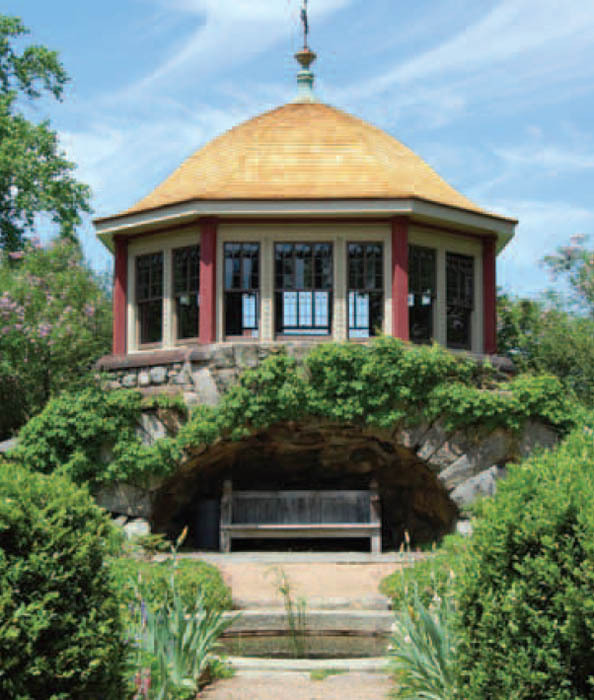 McIntire also designed a smaller, no less exquisite summerhouse for another member of the Derby family, now also traveled from its original location. It remained on the Derby, later Beebe, farm in Wakefield until moved to the grounds of the Peabody Essex Museum in Salem, where its setting on a small artificial mount has been carefully recreated. 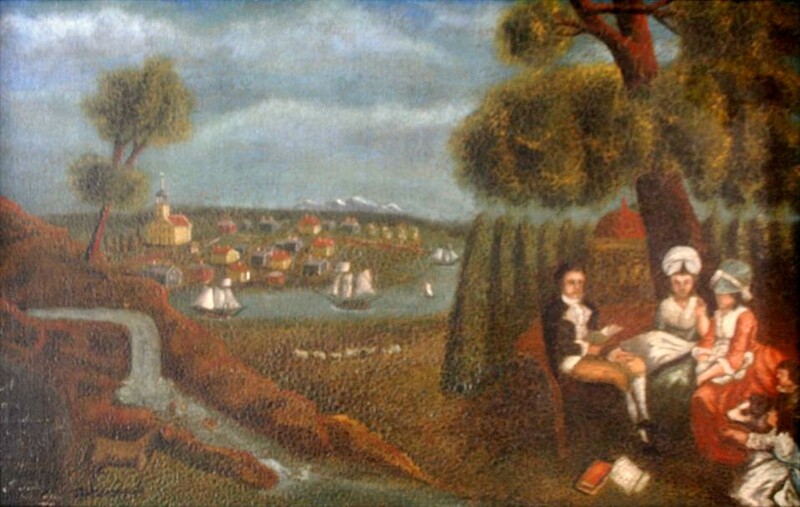 This late 18th century landscape painting by the Reverend Jonathan Fisher of Blue Hill, Maine shows a typical New England town, probably Bucksport, in the background, while in the foreground, a family enjoys tea by a domed gazebo. 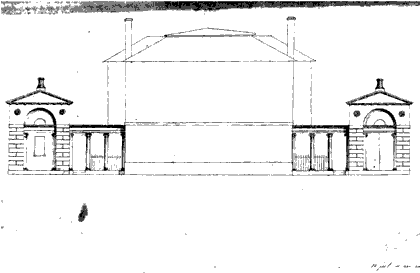 It is likely that this gazebo never existed there, but is an artistic conceit inspired by an English print. High Street in Newburyport, Massachusetts, is one of the handsomest streets of New England, lined with grand three story Federal mansions. In the early to mid-19th century, a local tradition of lattice summerhouses, often with ‘gothick’ touches arose, and several examples are still in situ. Here, above and below, in early photographs published in 1917 in Architectural Review are two of them. The New England tradition of save and recycle is at work here. 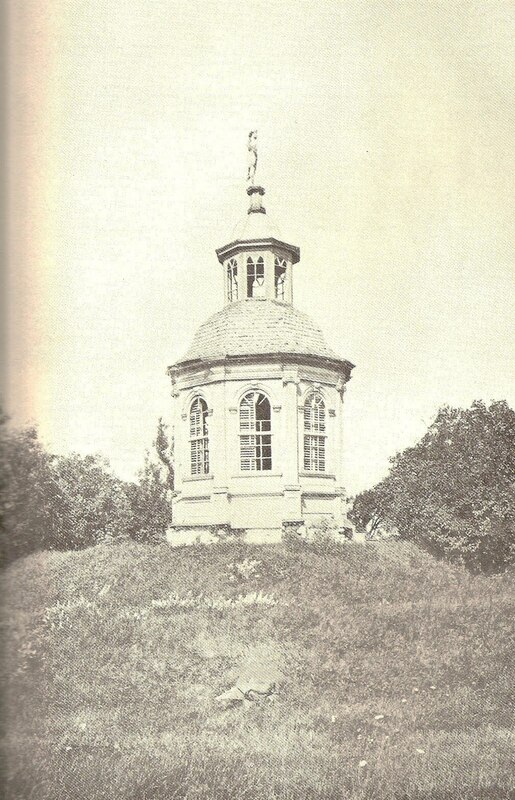 The octagon feature on the roof of example above in Newburyport was the originally the sounding board over a pulpit, salvaged when an early meeting house was being remodeled. 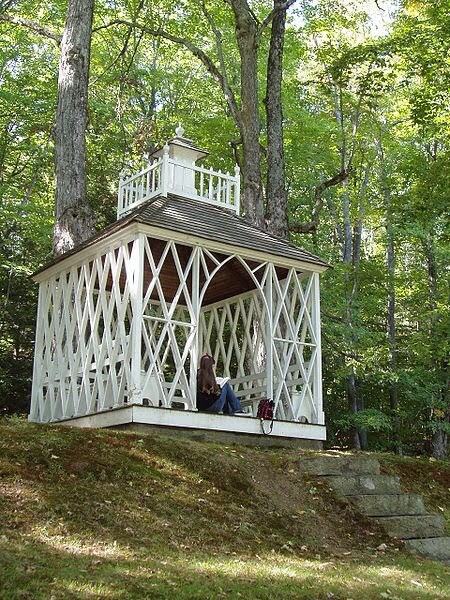 In rural New Ipswich New Hampshire, an impossibly light summerhouse is at summit of a mount, framed by an allee of maples, at Forest Hall, built as a wedding present for Charles Barrett and his bride. Those of us who can happily sit through Merchant-Ivory costume dramas will remember this as the location for The Europeans. 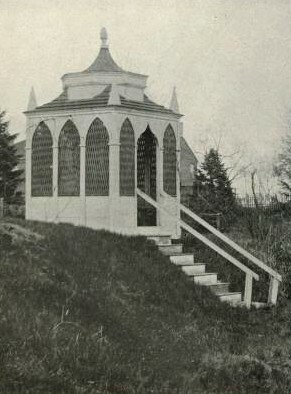 A Gothic Revival summerhouse in a garden at the childhood home of artist Waldo Pierce, friend of Hemingway, in Bangor, Maine. 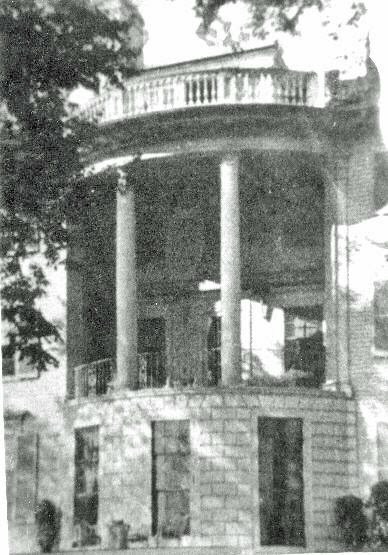 As the neighborhood deteriorated in the mid-twentieth century the gazebo was rescued by the Hutchins family, and moved to their estate at the edge of town, where it improbably, dreamily, appeared as an exotic apparition above I-95 for many years, but is now, I believe, lost. 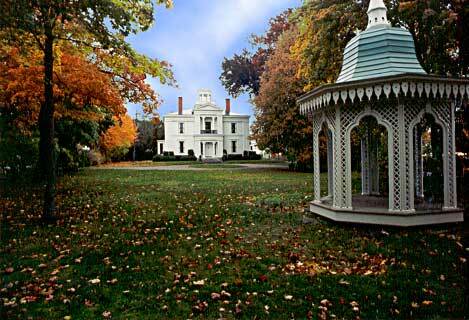 In Belfast, Maine, sits the magnificent Joseph White house, a Greek Revival masterpiece by Calvin Ryder. 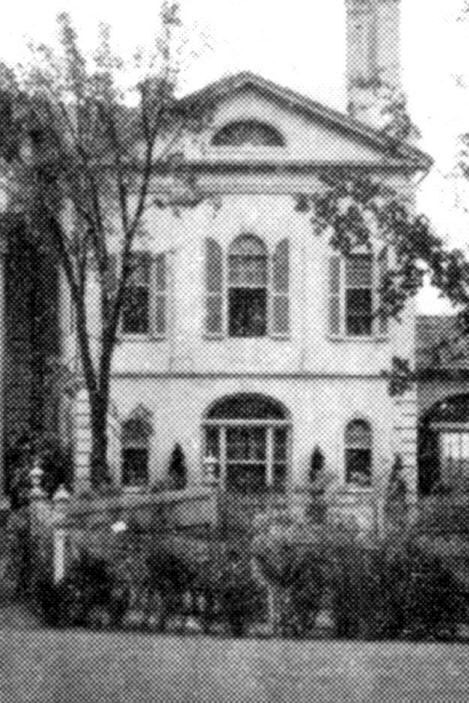 The house sits on a pie shaped lot at the juncture of two streets, and at the apex of the triangle, anchoring the street corner behind a classical iron fence, is this romantic example from the 1850s. 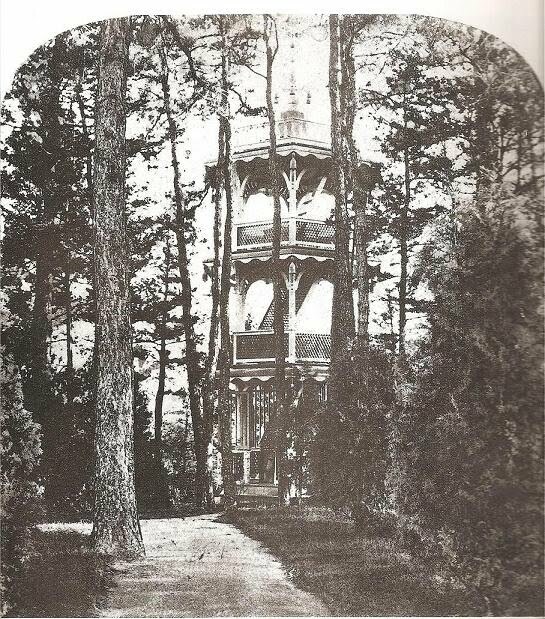 A leitmotif of the Victorian age was that more was never enough, and here we have a gazebo as observatory tower seen in the 1880’s on the J.S. Potter estate in Framingham, Massachusetts. 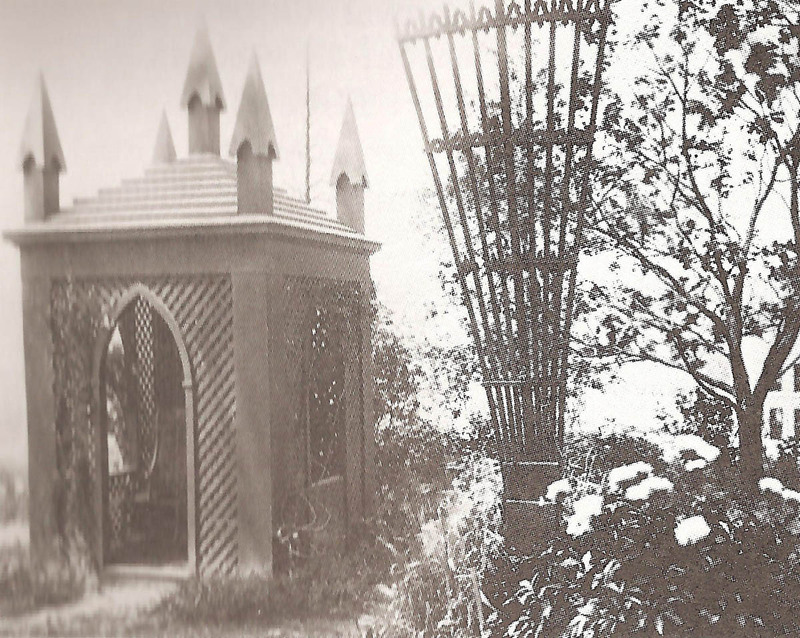 Potter was a self made businessman, and his garden was a veritable amusement park of garden structures. By the late 19th century, there were conflicting view on landscape design in New England—the Arcadian ideal, as espoused by Frederick Law Olmstead was one. It can be seen in this example, with grotto under, designed by the great man himself at Moraine Farm, built for the Phillips family in the 1880s. Another trend was European style grandeur and formality, ever the means to display wealth. 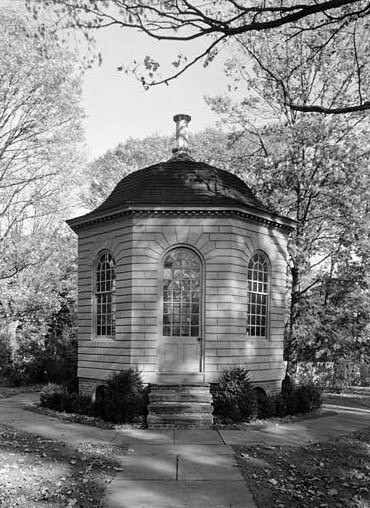 The apogee was reached with this pair of French classical limestone tea houses in the formal garden of The Elms in Newport, Rhode Island, designed by Horace Trumbauer for coal magnate Edwin Berwind. 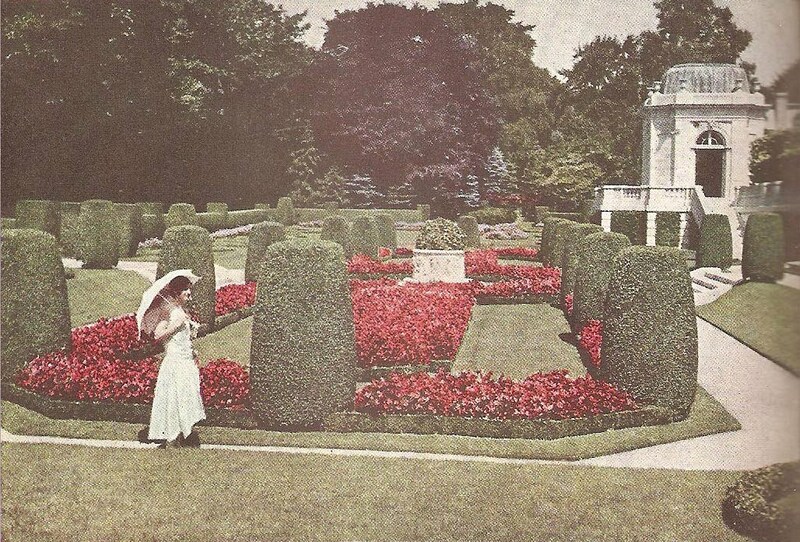 This photograph from a 1931 National Geographic shows the high level of maintenance that once characterized these estate gardens. A quarter century separates these structures from the Olmstead teahouse at Moraine Farm. 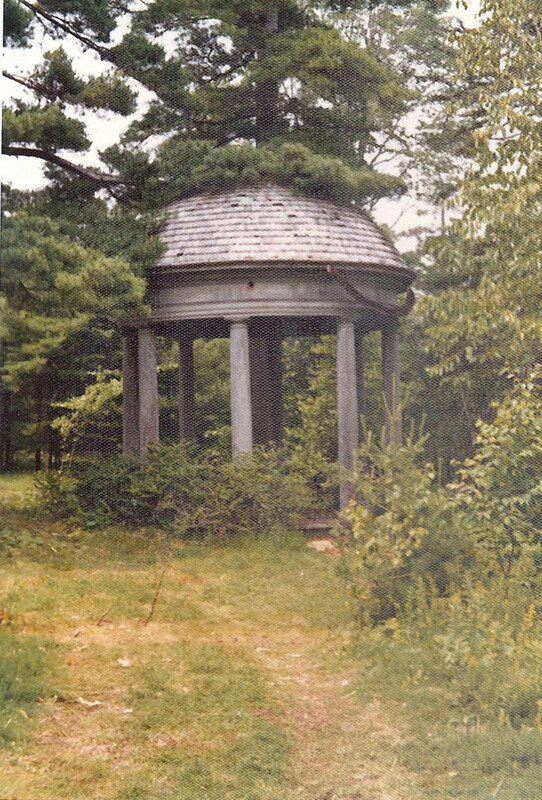 In Bar Harbor, Maine, the natural and the classical were brought together by this domed gazebo, situated in a carefully groomed naturalistic landscape recalling the paintings of Claude Lorrain. Although built of wood, this lovely structure improbably survived the 1947 forest fire that consumed the other buildings on the estate where it stood, including the enormous main house designed by R.H. Robertson, a mere two hundred feet away. This picture was taken in 1971, showing the effects of 25 years of abandonment in grounds gone wild. I believe the gazebo no longer exists. In the early 20th century, artist turned architect Charles Adams Platt, back from Italy, electrified America with a new sort of garden, based on Italian precedent, less grand and formal than the French beaux arts, gardens and house fully integrated with the rooms of the house. The garden with which he made this auspicious debut was at Faulkner Farm, the Sprague estate in Brookline, Massachusetts. 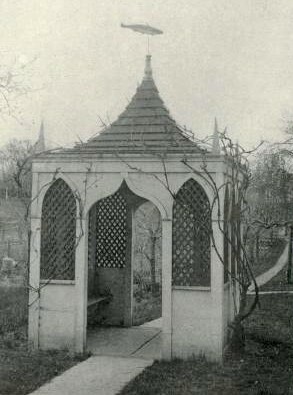 The summerhouse at the terminus of the dream-like formal garden, embraced on either side by a pergola, was one of the most admired of its day. Live or Memorex? 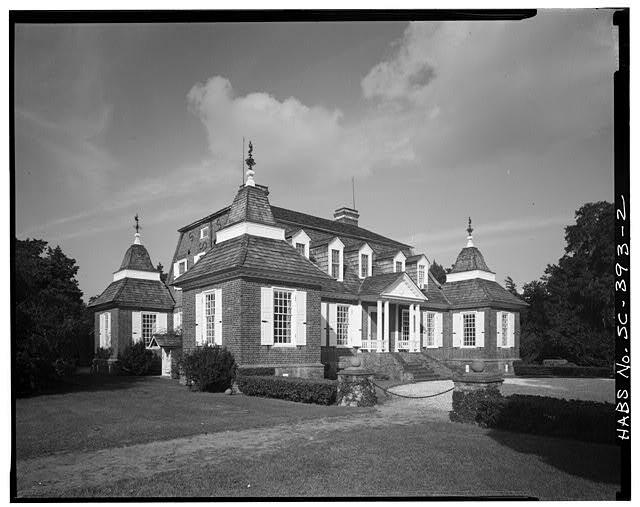 Will the real McIntire summerhouse please step forward? And finally, we travel more than full circle, back to Newport, Rhode Island. 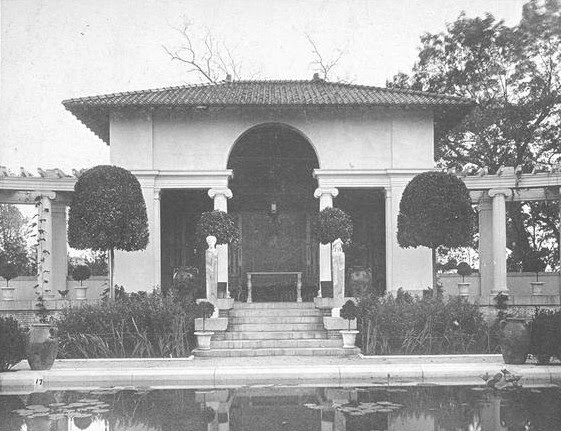 A mere two blocks from the Redwood garden house where we started, this tea house was designed by architectural historian Fiske Kimball, later director of the Philadelphia Museum, for Miss Martha Codman on the grounds of her summer home, Berkeley villa. In case you’re rubbing your eyes in disbelief, and about to say, ‘That stupid Dilettante, he’s inserted the wrong picture”, guess again. 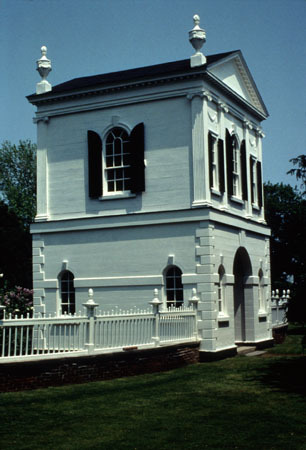 It is a copy of the Derby summerhouse by McIntire. Miss Codman was also a descendant of Derby, and a family feud was precipitated when she copied the summerhouse for her own garden without the permission of its owner, her cousin Mrs. Endicott. 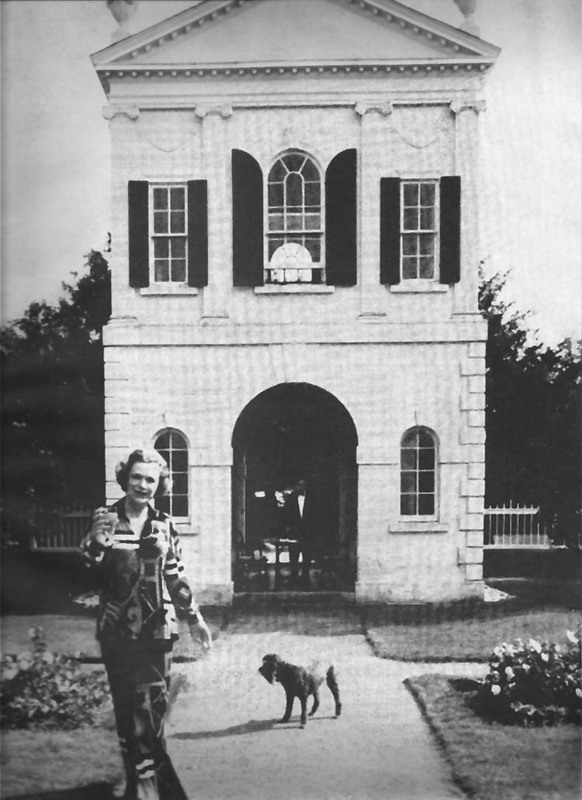 Actress Jane Pickens, later Mrs. Walter Hoving, purchased Berkeley Villa from the estate of Martha Codman.Here she is seen in front of the doppelganger teahouse, with butler in the background waiting to serve afternoon tea. One of the intriguing aspects of the E.T. Stotesbury summer cottage in Bar Harbor, also discussed in a previous post, is the giddy borrowing by Mrs. Stotesbury and her architects of details from famous New England houses of the Federal era. Although the house was not itself a masterpiece, it was beautifully crafted, and individual details were often lovely, despite the awkwardness of scale and proportion between many elements. 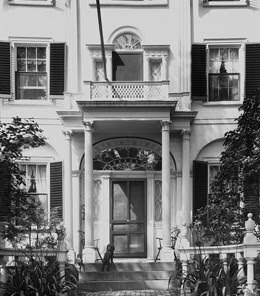 We know that Mrs. Stotesbury admired the Nickels-Sortwell House in Wiscassett, and a photograph of that house exists with notes by Mrs. Stotesbury about how much she admired its entrance, which would be cribbed for Wingwood. It is not a great leap to wonder if she ever consulted Fiske Kimball for ideas about great New England buildings for inspiration at Wingwood. Well known to her as the director of the Philadelphia Museum of Art, Kimball was an expert about early American architecture, and would eventually publish the definitive book about Samuel McIntire, the Salem architect-carver whose buildings would be heavily mined for details for Wingwood. 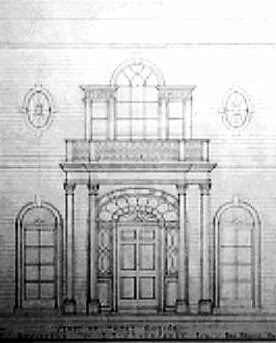 The overall massing of Wingwood’s garden front, with its wings forming a forecourt owes a great deal to Samuel McIntire’s design for the Elias Hasket Derby mansin of 1795 in Salem, one of the grandest houses of Federalist America. 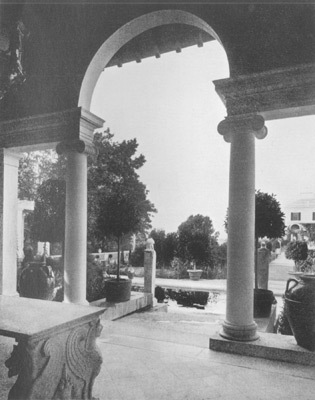 The main block featured a two story colonnade, with balustrade copied from a house in Lost behind the portico, was another, a copy of the Nickels-Sortwell portico and Palladian Window. Something was lost in the translation–the composition was fussed up with two poorly scaled arched windows on either side of the door, and two oval bathroom windows flanking the upper Palladian window. Further, the door was false, fronting the circular staircase in the Red Hall beyond, and the small arched windows were actually the doors to the hall. 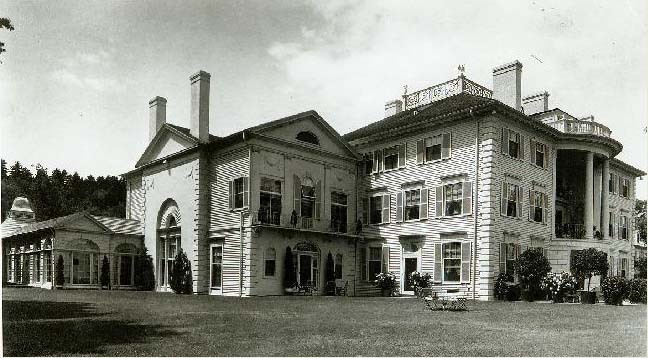 The two flanking wings, awkwardly scaled in relation to the main block, were blown up versions of McIntire’s famous summer house for Elias Hasket Derby’s country estate. Much wider than their prototype, the wings lost in the translation, with pasted on facades that did not ‘return’ on the sides. Spreading out from the McIntire wings were two arcaded galleries, one an entrance corridor, the other a long passage to a tea room. These also were based on a similar feature at the Derby mansion. 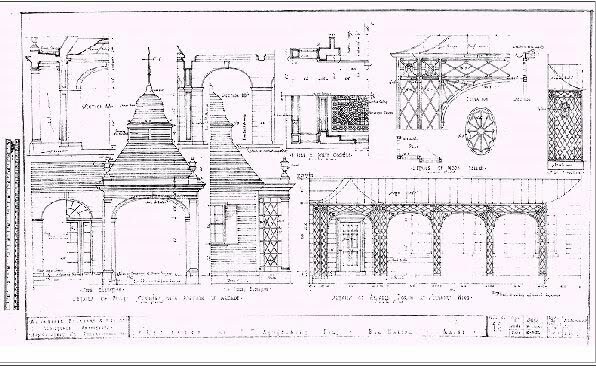 Finally, many leagues away from the Sortwell doorway, the arcade wings ended in two pavilions, one a porte cochére, the other a tea room opening into a ‘colonial’ formal garden designed by noted landscape architect Beatrix Farrand, a Bar Harbor neighbor. 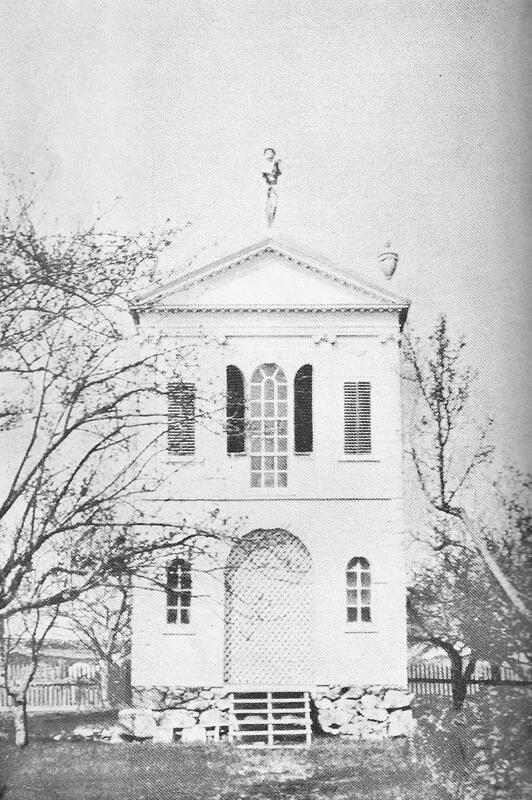 The rusticated facades of these pavilions, inspired by pavilions in Sweden, left the American neoclassical behind, but in their roof design takes us on an unexpected detour to the early 18th century south, and the famous roofs on the flankers at Mulberry Plantation outside Charleston SC, a long way from Wiscassett, Maine. Turning to the ocean front, one finds the window entablatures, and the side door from the Chippendale room are copies of details from houses near the Nickels House in Wiscassett, and of a pure Maine federal sensibility. The McIntire summerhouse facades re-appear on the wings. A giant Palladian window in the ballroom wing has no early American precedent, but is borrowed from a London design of Robert Adam. 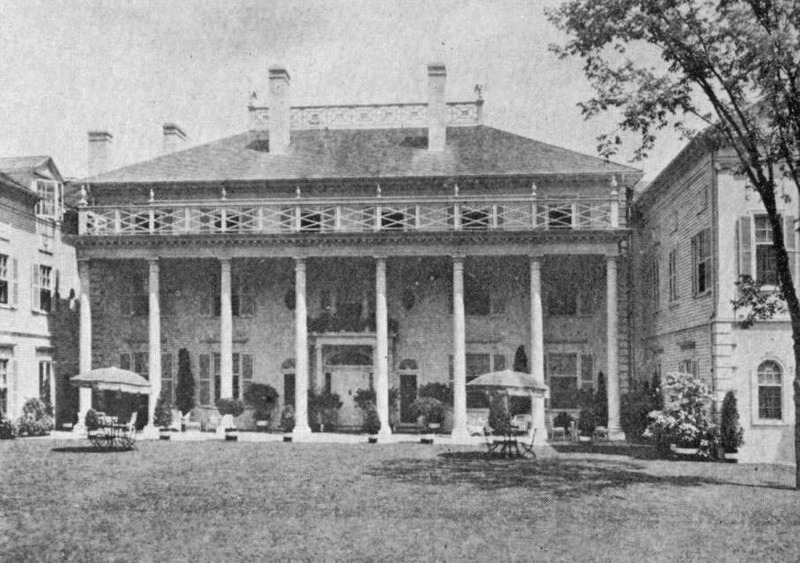 Finally, in the center of the main block, the giant curved portico, two recessed stories above a rusticated ovoid base, is directly based on both a similar feature in McIntire’s Derby Mansion, and Charles Bulfinch’s Joseph Barrell House in Charlestown, Massachusetts, later remodeled as the McLean asylum. Deterring from the composition is a wide fourth floor level dormer giving access to the portico roof. Charles Bulfinch. 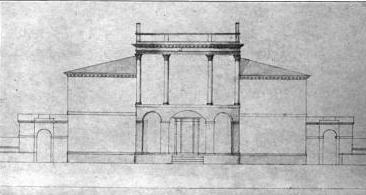 Design for Joseph Barrell House, Charlestown, Massachusetts, showing semi-circular portico. 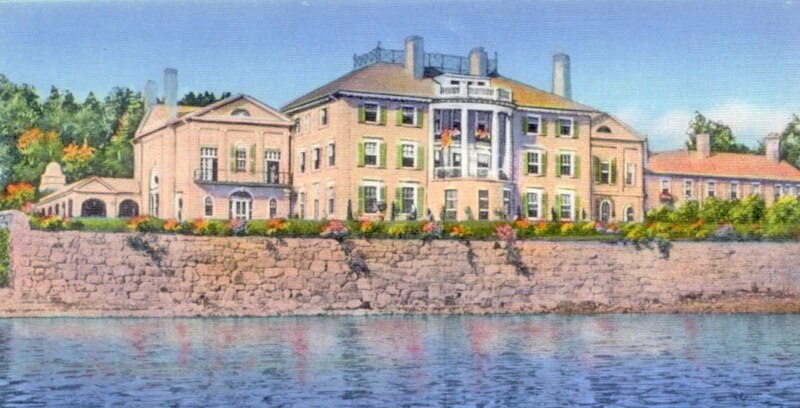 No doubt the decision to remodel the Cassatt cottage rather than build anew, combined with the mid-design change in architects and program, and Mrs. Stotesbury’s general preference for grandeur, did not help the project. It would probably have been better if the design had started from scratch. Nevertheless, Wingwood is an interesting footnote to an era and to it’s owner’s sensibilities. Wingwood. Vintage postcard view, 1930’s. 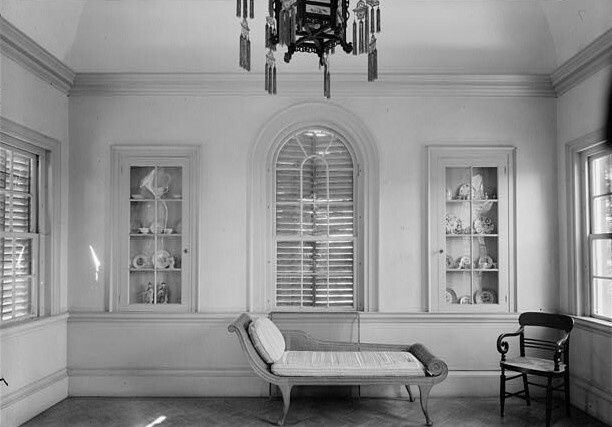 I’ll give you a couple of days to recover from this post, and finish up with a less talkative tour of the interior, where the pictures speak for themselves, and we get to count the Stotesbury’s silver flatware.